0:00 To add a text overlay to your video you first seek to where you want to start the overlay. 0:05 Then click the "Tools" menu button above the timeline and select "Overlay" and then the "Text" option or you can press the "O" key and then the "T" key. 0:14 First you enter your text. 0:19 Next you can position the text where you want it on the video and adjust the font size by dragging the corners. You can also adjust the width by dragging the edge handle shown here which will wrap words to try and fit the width you drag to. 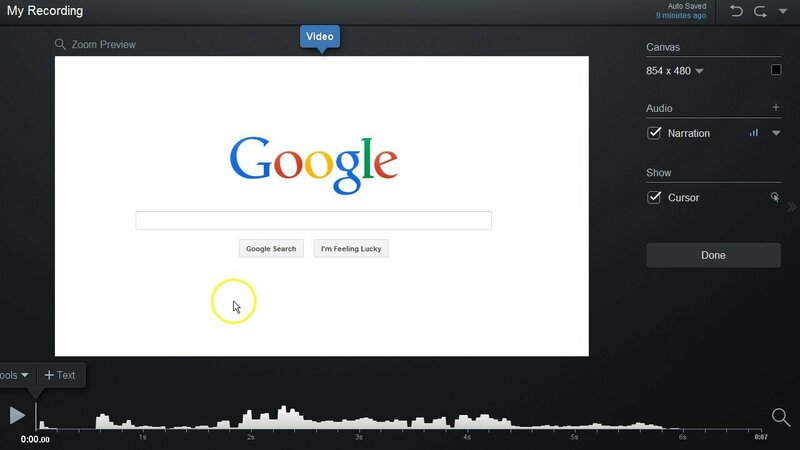 0:33 If you're using a pointer as shown here then you can drag that point to where you want it on the video. After setting up the pointer it will stay locked at that spot if you move the text body. 0:43 You can set some style properties for the overlay using the Style button. 0:47 You can choose Text style options by clicking on this button. 0:51 You can choose the color to use for the text. 0:54 You can also choose the Font to use. Depending on the number of fonts you have installed on your computer it could take some time to load the fonts the first time you click to edit this value. 1:04 Next you can choose the Background style options by clicking this button. 1:09 You can choose the Shape to use for the text background. 1:12 You can choose the color to use. 1:15 You can choose if you want the background to be semi-transparent by adjusting the Opacity. 1:20 You can also choose a shadow option. 1:23 And finally you can set if you want the background to use a Pointer or not by clicking here. 1:28 You can reuse style settings by clicking this button which will show a list of previous styles you used so you can easily switch back to a particular style combination. 1:38 You can choose to make the entire overlay semi-transparent by editing the opacity here. 1:44 By default the overlay will have a transtion to fade in and out. You can edit the transition in or out by clicking these buttons. You can choose to fade, pop, or have no transition. 1:55 To choose the section of video your overlay appears over you can drag these bars over the timeline to select the start and end point. 2:03 You can also jump the start point to your current seek point by clicking the "S" key. Or jump the end point to your current seek point by clicking the "E" key. 2:12 Its also possible to animate the overlay so it changes over time but we'll cover that in another tutorial. 2:19 You can preview your overlay by pressing the Preview button which will seek right before the overlay start then play through it and stop shortly after the overlay is done. 2:29 Once you're ready to commit you press the OK button or the Enter key	2:33 Anytime you make a change to the recording it is automatically saved on your computer. 2:37 After the overlay is added a colored span will show where the overlay shows on the timeline. If you want to later edit the overlay you can seek back to that spot on the timeline then click this icon which will bring you back to the overlay controls. And you can remove the overlay by clicking this icon. 2:54 Or you can also use the undo or edit history drop down to go back in time before you added the overlay. 3:01 The last used tool will be listed next to the Tools button above the timeline so you can easily use the same tool again by clicking on it here.